The day after Labor Day I woke up to an email from my contacts at St. Martin’s Press, inviting me to review six of their upcoming Christmas books, all of which have release dates in early October. For most people, this would probably be a problem — who wants to think about Christmas before Halloween — but for me, I’ve always had a soft spot for the man in the red suit. Even after I stopped believing in the Christ-Myth, I still loved that one holiday. To me, Christmas represents everything that Thanksgiving is supposed to be, but with better music and no obligatory turkey. Some of my favorite books have a Christmas theme and so I jumped at the chance to review those six books (well, five of them because the sixth has to do with cowboys and if there is one sub-genre I just cannot do is cowboys). 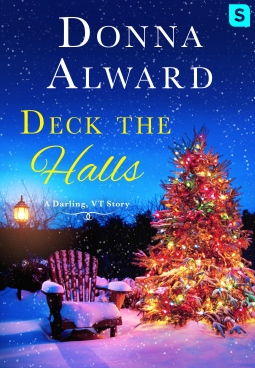 I read the first two, With This Christmas Ring by Manda Collins and Deck the Halls by Donna Alward, fairly quickly, especially since they’re both novellas. Both are being released in a little over a week, so it seemed like the time to review them. Miss Merry Parks makes a deathbed promise to a schoolfriend that her infant daughter will be taken to her absent father. There’s only one problem — to find the baby’s father, she’ll have to consult his cousin, Viscount Wrotham, the man she jilted five years ago. The man she couldn’t forget. Alex Ponsonby, Viscount Wrotham, is stunned to find Merry Parks — looking more lovely than ever — on his doorstep with an infant in her arms. His shock soon turns to dismay when he learns his own cousin William is the man who abandoned his wife and child. As head of the family he’s duty bound to see right is done. But he can’t let this opportunity pass. He’ll take Merry and the baby to his cousin, but he’ll woo her back in the process. I really enjoyed With This Christmas Ring, which was the first book I was able to get into after a month-long book slump. Ms. Collins’s writing style pulled me in from the first page and held onto me until the very last sentence. Her characters were fun, and I especially liked the female friendship that sprouted up about half-way into the book. I also enjoyed the interactions with both the hero and the heroine, and I was glad that for the most part, it did not fall prey to the novella-curse — the idea that a book would work better as a full-length novel because the themes are too heavy or the conflict too complicated to be worked out in a shorter form. However, there were some minor issues that keep this from being a five-star narrative. The first issue I had was the heroine’s name, Merry. One of the things that always bothers me in Christmas themed romances is when the author insists on giving their characters cutesy Christmas names. I would probably be okay with Merry being the heroine’s name if this took place in the US, but it doesn’t. People in the UK don’t even say Merry Christmas — they go with Happy Christmas instead, so calling the heroine Merry in a UK-based story doesn’t even make sense. Obviously, this is a personal issue and won’t bother other people as it does me, but I really needed to get that off of my chest. The other main criticism I have with this book is that one of the characters suddenly becomes a sociopath about 70% of the way through the story. This development and the subsequent conflict it causes felt out of place with the rest of the plot and was simply a deus-ex-machina used to get the rest of the characters on the same page. It felt as if Ms. Collins had written herself into a corner and couldn’t figure out any other way to get out of it. Plainly speaking, this was lazy writing at its worst. I’m sure she could have figured out another way to wrap things up, but for some reason this is what she chose to do. Sigh. I do have to hand it to Ms. Collins for including what I like to call a Christmas Deep-Cut — Lo How a Rose E’re Blooming. I don’t think I’ve heard that song in close to 20 years (my school choir used to sing it during Advent), so I got a real kick out of seeing it here. This is the second Donna Alward book I have tried to read this year and the second one that was a total failure, although considering its short length, I did manage to finish this one. To make things worse, I was actually really looking forward to reading this, mostly because the Netgalley page for it compared it to It’s a Wonderful Life, which is one of my favorite Christmas movies. Aside from the hero’s name being George and the heroine staying in Bedford Cottage this book had nothing in common with the Capra Christmas Classic. The biggest issue this book has is that it is boring. I wasn’t interested in anything that happened to either George or Amy. I didn’t care if he dealt with his PTSD or if he ever got over his survivor’s guilt. I didn’t care about her divorce or her need for answers regarding her brother’s death. The last time I read something this boring it was the summer of 1999 and I’d been assigned A Separate Peace by my 8th Grade teacher. I’m honestly not sure why I finished reading it. Why was it so boring? The characters had no chemistry whatsoever. We’re led to believe that George and Amy had explosive chemistry and shared a soul-rocking kiss 15 years earlier when they first met, but from what we’re presented, I don’t see it. There was seriously no ‘there’ there. The one good thing about this book is that I now know not to request another one of her books. I wish I could say that the first two Christmas books I’ve read this year left a better taste in my mouth, but I can’t. With This Christmas Ring wasn’t bad and had it not been for that ridiculous deus-ex-machina it would have received a much higher rating. I’m going to look for more of Ms. Collins’s books and hope that longer titles might have a better resolution. On the other hand, Deck the Halls was like cherry flavored medicine — deceptively bad. Here’s hoping the other three books are better.